The installation of protected bike lanes all over New York City not only protect bicyclists from dangerous accidents but also drivers and pedestrians alike. According to DOT statistics, streets with bike lanes have 40 percent fewer crashes ending in death or serious injury. A study realized after the Ninth Avenue protected bike lane was installed showed that all injuries related to traffic accidents decreased by 50%. Pedestrian injuries decreased by 29% and cyclist injuries by 57%. 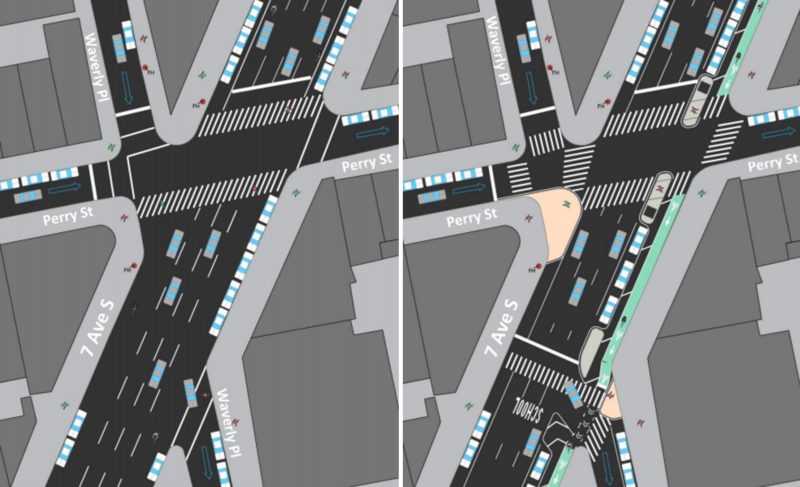 Last week the DOT announced that the many cyclists using Seventh Ave to ride South in Manhattan will now be able to use a protected bike lane from 30th Street to Clarkson Street. Half of the protected bike lane, from 30th Street to 14th Street was installed at the end of last year. The DOT finished installing the other part from 14th Street to Clarkson Street last week. The DOT still needs to paint the lane in green. The DOT is also planning to install five concrete pedestrian islands along the way as well as additional safety improvements for pedestrians. Ruthie Ann Blumenstein is a Tony-Waward winning actress. 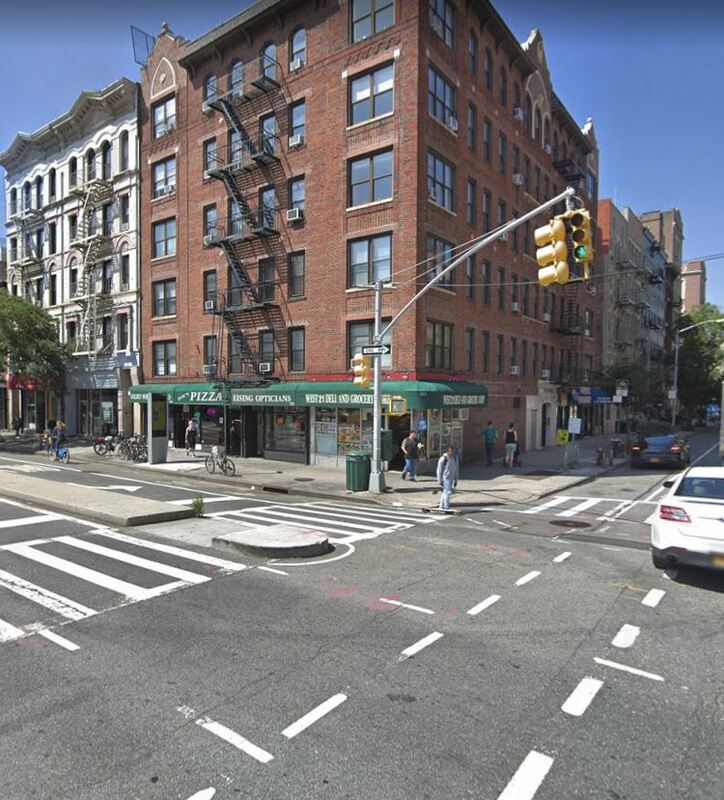 The actress and her daughter Abigail were among a group of pedestrians who were crossing the intersection of Fifth Ave and 9th street in Park Slope, Brooklyn, when Dorothy Burns ran a red light and erratically plowed into them. Abigail and 20 month old Joshua Lew died at the scene of the accident. Several pedestrians were injured including the pregnant Ruthie Ann Blumenstein. Dorthy Burns was recently indicted by a Grand Jury and was charged with manslaughter, assault and criminally negligent homicide (see previous blog). Burns suffers from multiple sclerosis. Prior to the fatal accident she received 12 driving violations for speeding in school zones and running red lights. Her license is now suspended. It is outrageous that she was still allowed to drive at the time of the accident. 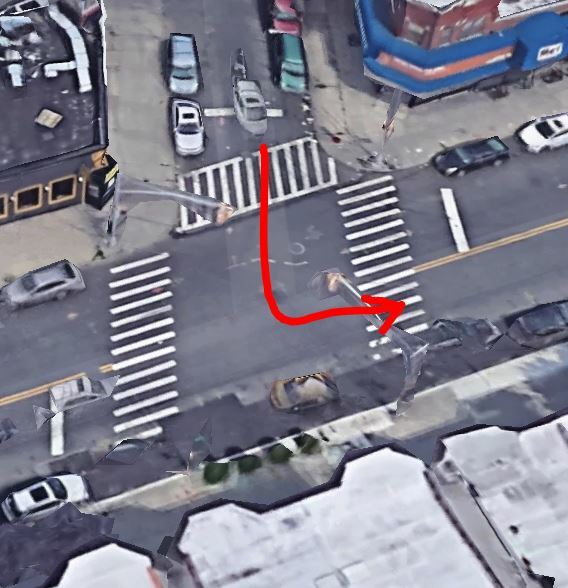 Two months ago Dorothy Burns ran a red like, killed two young children and injured 3 pedestrians in a horrific accident in Brooklyn, NYC (see previous blog). The 2 children were 20-month-old Joshua Lew and 4 year old Abigael Blumenstein, the daughter of Tony award actress Ruthie Ann Miles. Burns was indicted by a Grand Jury last Wednesday and was charged with manslaughter, assault and criminally negligent homicide. Burns had a history of reckless driving. Since 2016 she accumulated 12 driving violations from speeding in school zones and running red lights. Burns suffers from multiple sclerosis and it is unclear why she was still allowed to drive at the time of the accident. Her license is now suspended. 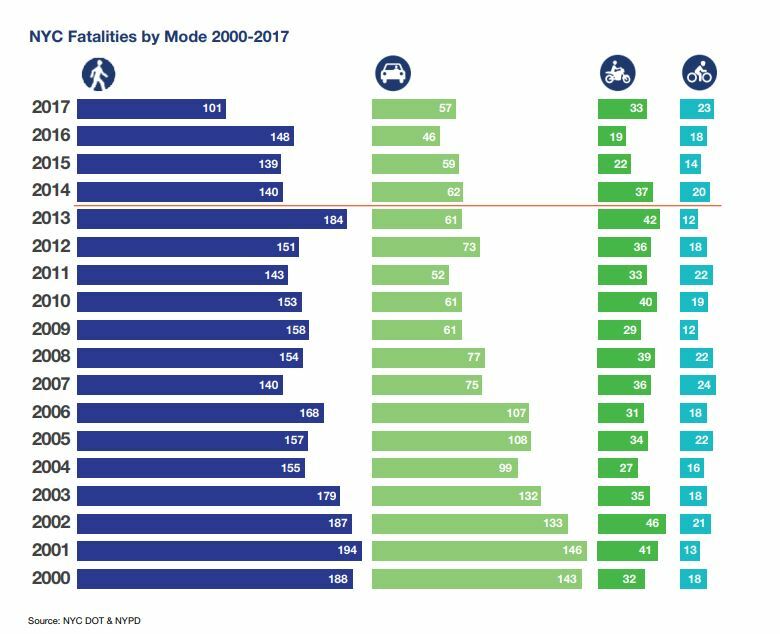 2,049 people died in 1,980 fatal hit and run crashes in 2016 in the US according to a study recently released by the AAA Foundation for Traffic Safety. This is the highest number of fatal hit and run crashes ever recorded in the US. Among the 2,049 people who died in these accidents, 1,229 of them were pedestrians, 169 were cyclists, 380 of them were drivers and 229 were passengers. Since 2009 hit and run crashes increased by an average annual rate of 7.2% per year. 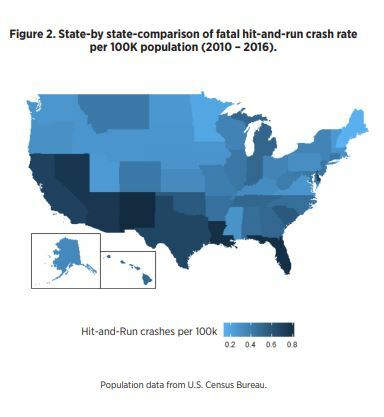 New Mexico, Louisiana and Florida have the highest rate of fatal hit and run crashes per 100,000 people while New Hampshire, Maine and Minnesota have the lowest rate. Almost 60% of the victims of fatal hit and run are pedestrians with elderly over 80 year old and children under 6 being 50% more likely to be a victim of such accidents. Gender is also a factor. 70% of pedestrians dying in a hit and run accidents are male. An elderly woman died and her husband is in critical condition after both got hit several times in a freaky car accident at a Brooklyn car wash in New York City. Tuesday afternoon around 3:00 pm, an elderly couple brought their car to a car wash located next to the Mobile gas station on Avenue U and Gerritsen Avenue in Marine Park. As their car was coming out of the car wash it was hit by a black Jeep that had been left in neutral. The elderly couple were inspecting the damages on their car when a 61 year old employee of the car wash got behind the wheel of the black Jeep. 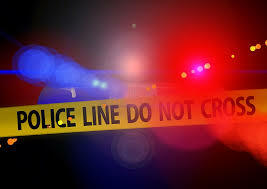 He backed the Jeep up in the garage and hit a wall of the building, then for some unknown reason he drove forward speeding, striking the couple and crashing into their car. The impact was so strong that the couple’s car then crashed into two other parked cars across the street. The car wash employee then backed up again and drove forward again striking the woman for the second time. He repeated the same back and fourth maneuver for a third time before car wash employees were able to stop him and get him out of the car. The 85 year old woman identified as Joane Tornabene died at the scene of the accident. Her 90 year old husband, Frank Tornabene was rushed to the hospital in critical condition. The police are still trying to figure out the reason why the car wash employee behaved so erratically. This is the second time in a week that someone was struck by a vehicle at a NYC car wash. A car wash worker lost his leg on Saturday in Queens . The man was wiping down a vehicle when he was struck by another car driven by a co-worker. Since Vision Zero started in 2014, NYC traffic fatalities decreased by 28% while nationally they went up by 15%. 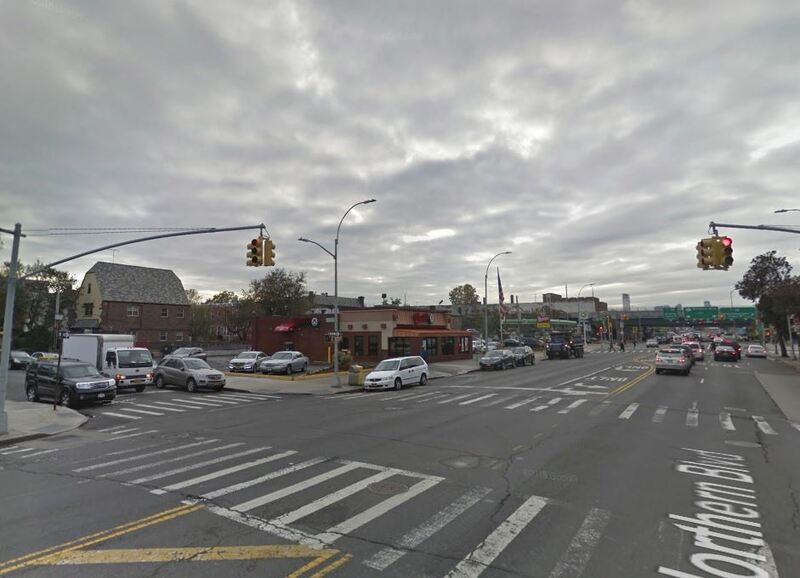 According to the Fourth Vision Zero Annual Report that was recently released by the de Blasio Administration, the decline was the strongest in pedestrian deaths. They went down by 45% since the program was launched in 2014. Last year, under the Vision Zero umbrella, the city installed 832 additional Leading Pedestrians Intervals (LPI). 24.9 miles of protected bike lanes were built leading to a total of more than 60 miles of protected bike lanes in the City. Left turn calming treatments were placed at 110 intersections. 390 speed bumps were also created all over the five boroughs.